Corinth Holders High JROTC cadet Tyler Lucas participates in the 2018 Veterans Day ceremony. Hundreds of veterans and their families gathered at Smithfield-Selma High for the 14th annual Johnston County Public Schools Veterans Day ceremony on Monday, Nov. 12. For the past decade Johnston County Public Schools has honored local veterans with the special program. 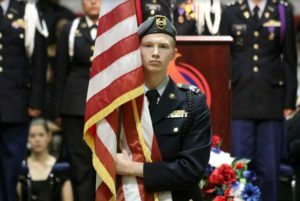 The event was completely student led and is a joint effort by the district’s high school JROTC cadets, All-County Chorus, and All-County Band. All Johnston County veterans were welcome to attend.